Instagramming ballot photos shouldn't be illegal in the social-media election age. Long gone are the days when whom you voted for remained private—thanks, in large part, to Facebook, Twitter, YouTube, and Instagram. But the laws need to keep up with the way our communications system is evolving. A new study from Pew Research, titled “Social Media and Voting” and conducted via telephone between Nov. 1 and this morning, found that 74 percent of those surveyed engaged in some form of social media sharing regarding the election. Thirty percent said they had received social media messages from family and friends in the last 30 days encouraging them to vote, and 20 percent said they themselves shared messages to try to influence their friends. Interestingly, the survey noted women were more likely to receive messages from family and friends to vote for certain candidates than men were—though whether that’s a result of mansplaining or women’s more active social networks isn’t clear. (Women are also much more likely to click on Facebook’s “I voted” widget.) It’s likely that this social-media peer pressure actually made a difference: Earlier this fall, my colleague Will Oremus wrote that one study found that Facebook users can actually persuade their friends to go out and vote. Pew also found that after visiting their polling places, 22 percent shared whom they voted for on Facebook or on Twitter. But there’s a significant generation gap here: Twenty-nine percent of all voters under the age of 50 shared their ballot choices with the world, but while only 17 percent of those over 50 did so. Pew’s findings focus on Twitter and Facebook, but voters have also been using YouTube and Instagram to document their voting process today. YouTube even encouraged voters to vlog about voting and upload the video to their Election Hub. And as images of people Instagramming their ballots began to pop up, blogs like Gizmodo were quick to warn that taking such pictures could violate the law—in fact, in certain states sharing a photo of your ballot is a felony offense. Of course, photographing other people in the voting booth along their ballots without their permission isn’t a good idea. But how could posting a photo of your own ballot constitute “election fraud” when almost one-quarter of voters—and more than that, among younger voters—already share their votes? 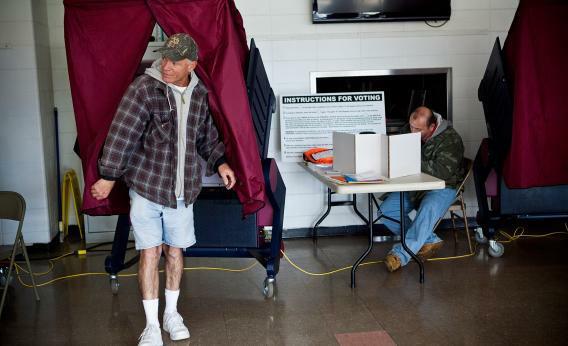 Prosecuting someone for photographing their own ballot is so last century.